The connection access dialog is where you grant or modify access to use this connection to other users. To set the connection access you need to go to the Administrative Database menu. Note: This topic does not cover authenticating the connection to the database. Connecting to the database is covered in Database Connections. This current topic specifically covers users connecting to dbFront so that thay can access your applications. You must be an Admin user to make any changes in this screen. Administrative access is always managed by Windows Authentication. 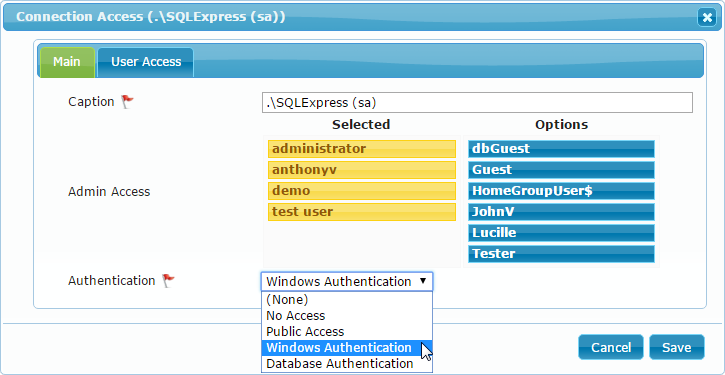 Any users with Server Level Administrative access to the Application Server will always have Admin access. An Admin user can't demote themselves but they can demote and remove other Admin users. dbFront supports several types of Authentication. Depending upon the authentication type you chose, other tabs will appear with further options. No Access: Only Admin users can access the database. Public Access: Public users have read only access via a special URL that can be imbedded in a public site. Database Authentication: Users are Authenticated via a custom database procedure. b) Individually give Non Admin users Update or Read-only access.